From version 4.51, you can use the mouse buttons in combination with a keyboard key as a combination to paste texts and run windows commands. Very handy, because you do not have to do a balancing act on the keyboard with your hand and thus can insert / paste meaningful texts or a complete selection of texts. Here's a simple example how to make good use of this feature. Of course, regardless of whether it's the new Microsoft's Windows 10, or one of the older desktop, or server operating systems. 1.) ... The creation of a meaningful text selection. 2.) ... The use under MS Office in Word! 3.) ... The thanks commands as an import template for QuickTextPaste! See also: ► Date Time Format in QuickTextPaste! 1.) The creation of a meaningful text selection. Here, as an example, I hid some thank-you texts behind the left mouse button, so if I press the left mouse button and the [D] key, the selection menu with the predefined texts appears, which can then be easily sent to any program under Windows via the clipboard. or add further texts by clicking the Add button. ► ... Tips for quickly changing texts in Quick-Text-Paste! (Image-1) Use right, left, middle mouse button as clipboard command for Windows! 2.) The use under MS Office in Word! Here is the result, if you press the left mouse button and press the [D] key, the predefined text will appear. And that is not only suitable for Microsoft Office 365 Word, Excel, etc. ... No, that works in any other text processing programs, or in empathy forms on the Internet. If you notice a mistake in the text, you can just open and edit it by pressing Shift and selecting directly in QuickTextPaste to better spell it out or fix spelling mistakes. (Image-2) From the clipboard by shortcut in eg: MS-Word! 3.) The Thanks commands as an import template for QuickTextPaste! text_003=L-Mouse+D=Thank you\n\nWe will contact you as soon as possible and inform you if necessary. The elegant way to use the middle mouse button as a clipboard friendly button is not just written for Windows 10, as you can see above in Windows 10 shot screenshot, you can easily and without hesitation also use this example as mouse button clipboard on previous / other / No matter if it's a Windows desktop, or the clipboard on the tablet, Surface Pro / Go, or even a server OS to be upgraded, it has been getting at it all - using older / versions of Microsoft's Windows operating systems. 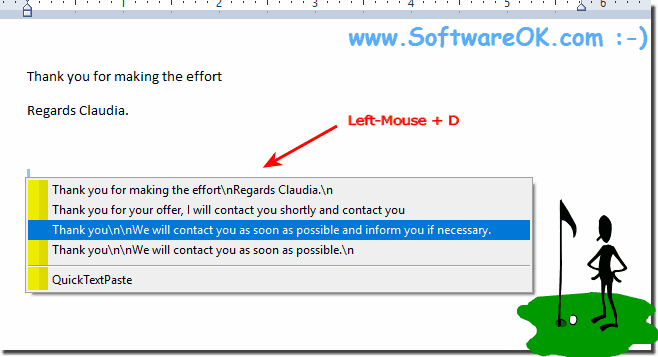 QuickTextPaste - FAQ-35: Use right, left, middle mouse button as clipboard friend! If you want to import from this side, or any text examples here, you can import Commands / Texts in the program QTP from version 4.51 Content: 1.